You adore your granddaughter! Here are a few jewelry gift ideas for your granddaughter that will show her how special she is in your heart. You adore your granddaughter! Show her how much she means to you with one of these lovely pieces of jewelry that she'll cherish for years. These can be given for Valentine's Day, birthdays, Christmas, Hanukkah, or any other special occasion you celebrate with your granddaughter. Be sure to put some thought into the jewelry you choose. Your 15-year old granddaughter will appreciate something more sophisticated than your 5-year old granddaughter! Ask her parents if you're not sure. Your granddaughter holds a special place in your heart. One way to tell her how special she is to you is with this charming "Always in my heart" bracelet, with two hearts that clasp together. It's a simple and elegant design with a heartfelt message. The smaller heart represents your granddaughter, and the larger one represents you, her grandparent. The smaller heart is adorned with a solitaire diamond, and is nestled inside the "grandparent" heart when the bracelet is clasped together. On the inside of this bracelet is engraved, "My Dear Granddaughter, You are always in my Heart". You've most likely read the beautiful Footprints in the Sand poem. Share your faith with your granddaughter with this lovely, sparkling sandal-shaped pendant necklace, made of sterling silver with 24K gold accents. Swarovski crystals adorn the sandal strap and footprints are engraved on the sandal bed. Engraved on the back is this line from the Footprints in the Sand poem, "When you saw only one set of footprints, it was then that I carried you". This pendant with 18" chain comes with a special "For My Dear Granddaughter" card, along with a velvet pouch and gift box. What pearls of wisdom can you impart to your granddaughter? This lovely and lustrous "Pearls of Wisdom" necklace is made of cultured freshwater pearls and fastens with a heart-shaped clasp inscribed with "My Granddaughter, My Joy". Pearls are always in style, and your granddaughter will be able to wear this classic 18" necklace for years to come. The necklace comes with a keepsake case that includes a poem with words of wisdom such as, "Remember friends and family", "Don't shy away from what is right", "Let kindness spread like sunshine", and more. My mother gave me a small heart locket similar to this when I was a young girl, and I cherished it. This makes a great gift from a grandparent as well. PLEASE NOTE that this is a very small locket! The diameter is about half the size of a dime, and with its 13" chain, it's perfect for a small girl, 3 - 8 years old. The negative reviews on Amazon mostly refer to the very small locket size (remember, this is for young girls!). Some reviewers suggest buying a sturdier chain as well, although I remember mine had a very fine chain. I was careful with it! If your granddaughter appreciates a casual, more contemporary look, this silver-plated heart charm will be appreciated. Includes a couple of Swarovski crystals and Swarovski pearl, hanging from a 16" adjustable leatherette cord. Comes with a card with the warm sentiment, "Granddaughter far or near, remember that I'm always here". This Expressively Yours silver-plated and crystal beaded bracelet makes a thoughtful gift for your granddaughter. 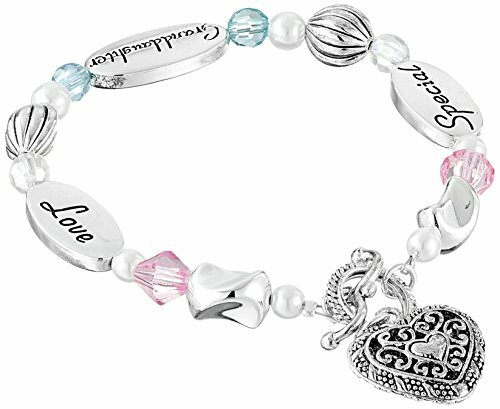 Blue and pink beads add a nice splash of color, and three flat silver beads read, "Special", "Love", and "Granddaughter". A pretty heart charm is attached to the clasp. Comes in a nice gift box, and includes an inspirational card telling your granddaughter how dear she is to you. Your young grandson is the apple of your eye! Give him a special keepsake gift as a reminder of your special love for him. Do You Have a Granddaughter Who Would Enjoy the Gift of Jewelry? I have two little granddaughters. These are really nice and I'll keep them in mind for when they get older. I also like the footprints in the sand necklace -- I think it's such a beautiful design, expressing a beautiful sentiment! Thanks for your comment, Caroline! I like the footprints in the sand necklace best. These are nice pieces for keepsakes. That's such a great idea, Terri! Not yet! But I got my nieces a charm bracelet each when they were tiny and buy a charm for them each year.